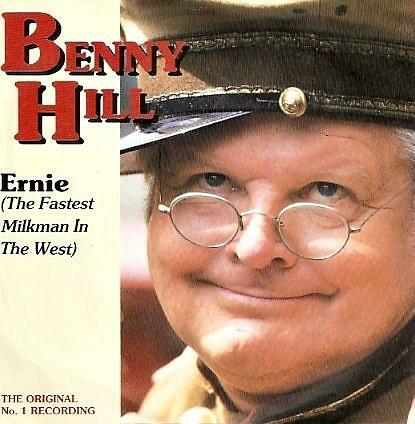 BENNY HILL - "ERNIE (THE FASTEST MILKMAN IN THE WEST)"
In typical Benny Hill fashion, this amusing novelty record was packed with innuendos. The song reached No.1 on 11th December 1971 and stayed on top of the charts for four weeks (including Christmas week) before being superseded by the New Seekers with "I'd Like To Teach The World To Sing (In Perfect Harmony)". The lyrics are fictional, but are loosely based on Hill's memories of actually working as a milkman for Hann's Dairies. They tell the story of Ernie Price who rides a horse-drawn milk cart, and details his battles with the local bread delivery man, Two Ton Ted from Teddington - he was played by Henry McGee in the video. Ernie was actually penned in 1955, and was intended to be used as the into to a screenplay about Hill's experience as a milkman, although the screenplay was never filmed. 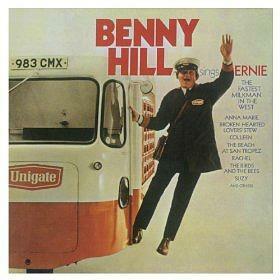 Hill performed the song on The Benny Hill Show in 1970, although it was broadcast in black and white due to a strike by technicians - almost everyone seemed to go on strike at some point in the 70s - and the clip is rarely shown because of this. Charlie Chaplin was a fan of Benny Hill's work (and vice versa) and his family invited Benny to his home in Switzerland. Hill was amazed to discover that Chaplin had a collection of his comedy work on video. David Cameron is a fan of the song and picked it as one of his BBC Radio 4's Desert Island Discs programme in May 2006.